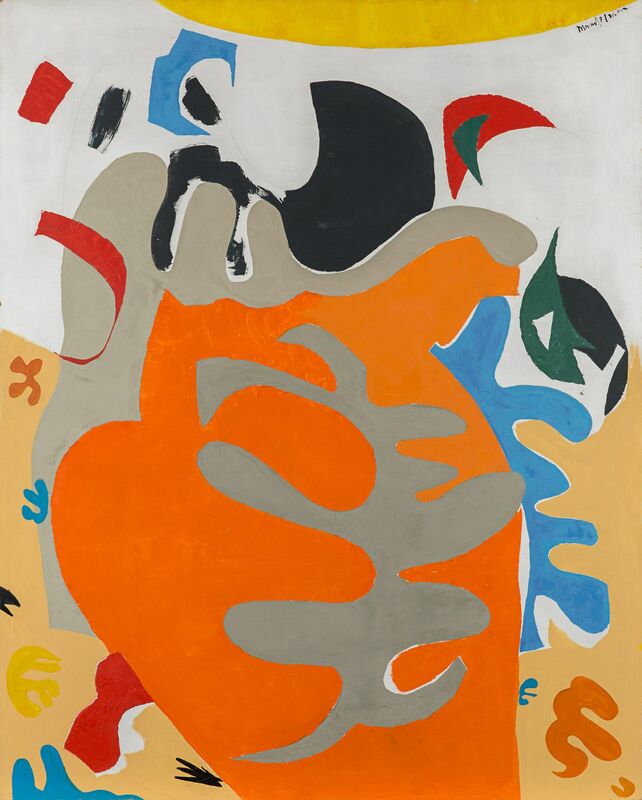 Beatrice Mandelman, Sea Shapes (#1), c. 1960s, oil on fiberboard, 60 x 48 in. December 9, 2016 - Rosenberg & Co. is pleased to present Beatrice Mandelman And The Sixties, an exhibition dedicated to Beatrice Mandelman's works from the 1960s. At the time, Beatrice Mandelman and her husband Louis Ribak were at the epicenter of a group of artists in Taos, New Mexico known as the Taos Moderns. Although Mandelman is primarily known for her abstract paintings, Rosenberg & Co.'s exhibition demonstrates that she innovated across different media and genres while remaining resolutely dedicated to her singular vision. The 1960s were a decade of change and revolution, giving rise to Pop Art, Op Art, Minimalism, and Conceptualism. And yet, while Mandelman herself was a champion of the leftist ideals of the time, her artwork evaded simple categorization and was instead indicative of her unique hybridization of experiences. Although her works from the 1960s were influenced by her time working for the Works Progress Administration in New York and by her year in Paris studying under Fernand Léger, they also reflect the light and colors of the striking Southwest landscape. In Sea Shapes (#1) [illustrated above], the tangled organic shapes evoke both Matisse's cut-outs and the ocean's flora and fauna. Despite her dedication to painting in a vocabulary of pure abstraction, a number of her works on paper are very much anchored in the figurative and typographic imagery of the real, tangible world, giving insight into her political convictions and concerns. Her politics were made particularly explicit in a series of anti-war collages that she made in protest of the Vietnam War. Collage No. 9, an archetypal work from this series, depicts a model's face, clearly lifted from a glossy women's magazine. Mandelman partially defaced the cut-out visage with rips and tears through the lips and nose, and surrounded it with explosive swirls of color and the words "revolution," "war," and "help! ", epitomizing the zeitgeist of that generation. Beatrice Mandelman (b. 1912, Newark, NJ, d. 1998, Taos, New Mexico) was part of a group of artists known as the Taos Moderns, and was a founder of the Taos Valley Art School. During her lifetime, she exhibited at the Chicago Art Institute; the Dallas Museum of Art; the Museum of Modern Art, New York; the National Gallery of Art, Washington D.C.; and the Whitney Museum of American Art, New York. Today, her works are included in public collections across the United States, including such venerable institutions as the Art Institute of Chicago; the Denver Art Museum; the Metropolitan Museum of Art, New York; the National Gallery of Art, Washington, D.C.; and the Smithsonian American Art Museum, Washington, D.C.; works are also on long-term loan at the Museum of Modern Art, New York. Save / follow Rosenberg & Co. This page was added 7th January 2017, 17:06 by Rosenberg & Co.